My husband loves meatballs, and when I give him a choice of whats for dinner, if I say “spaghetti”, the phrase “with meatballs” had better follow or he will pass. 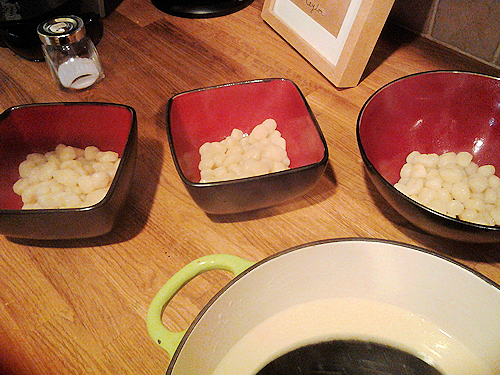 Well, tonight my little one wanted gnocchi. She calls it pillowy goodness. 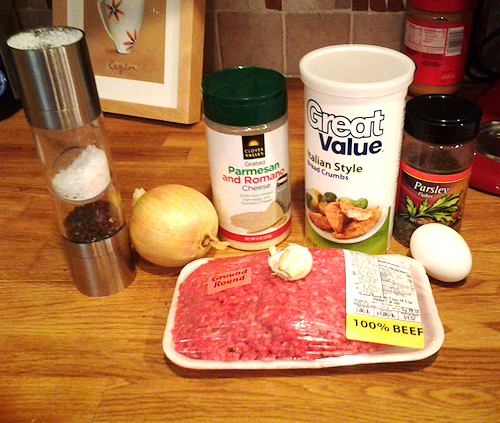 Ground Beef 1 to 1/2ilbs will do. 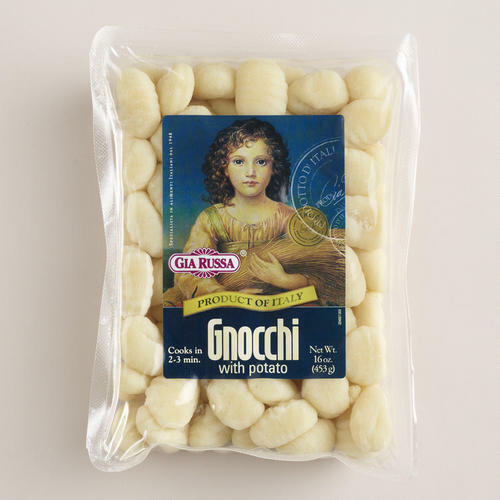 1-2 packages of gnocchi depending on how many you have to serve. 1 package will make about three portions. a few tablespoons of extra virgin olive oil for coating the saute pan. So first things first, lets make the meatballs. Tonight I had some fresh ground beef so I just went with that. Sometimes you just don’t have time to run out and get all kinds of different meats to blend so use what you have! 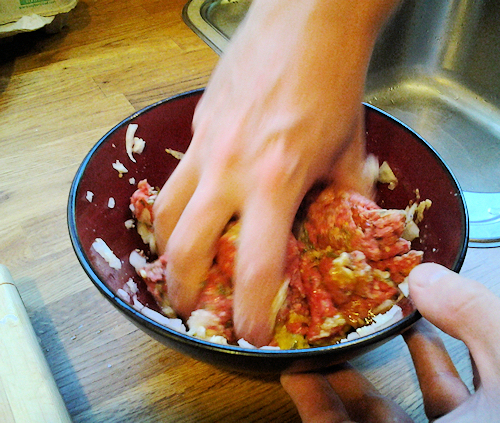 Add beef, egg, cheese, salt, pepper,chopped onions, spices and herbs with bread crumbs into a large mixing bowl. Get in there and mix it well. I called upon the hubby to mix this for me and he dove right in before I could get the next picture taken! 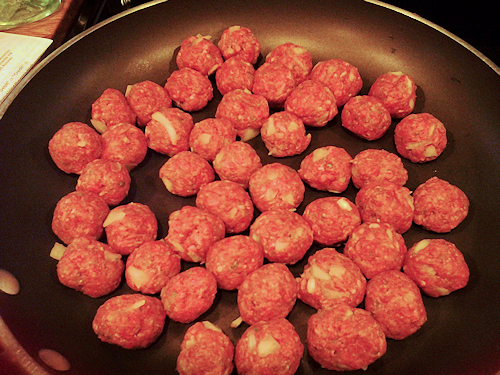 When everything is combined, start making your little meatballs. I made these about “bouncy ball size” C’mon you know you all have one of those!! Ok ok, half the size of a gold ball …better? Then set them in a pan that you have lightly oiled with some Extra Virgin Olive Oil. When you have them all rolled and in the pan, turn on the heat to medium and start cooking these babies till they need to be turned. About 5min each roll. When they are all done and ready to go, drain any excess fat off the pan and pour your pasta sauce right into the pan and let simmer on low heat. Let’s get that gnocchi now. These will take no time to cook maybe 8 minutes tops in a rolling boil. 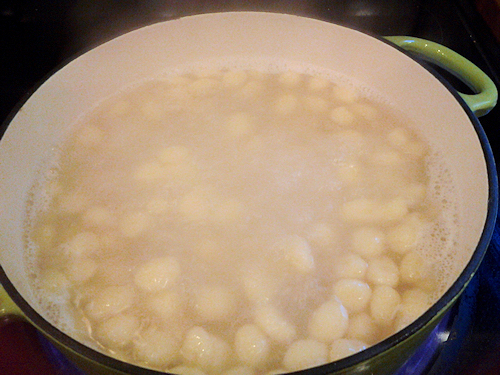 Fill up your favorite pasta pot 3/4 way full, add a small palm of salt, let boil and add gnocchi into boiling water. 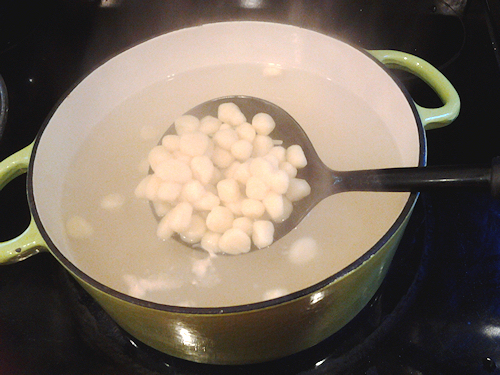 When gnocchi is done it floats. 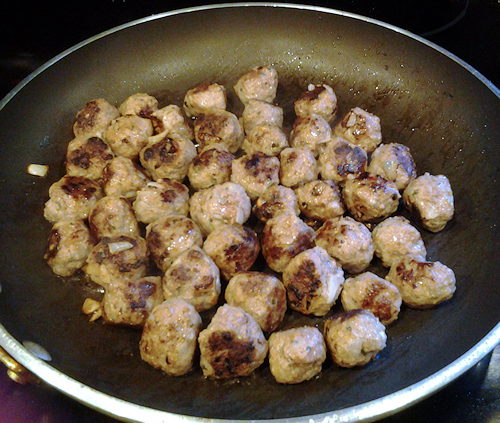 Ladle your servings into a bowl and get ready to ladle on your meatballs and sauce. Splash on some Parmesan cheese and fresh basil for a pretty bowl and you’re ready to eat! These are so soft to eat it is almost comforting. 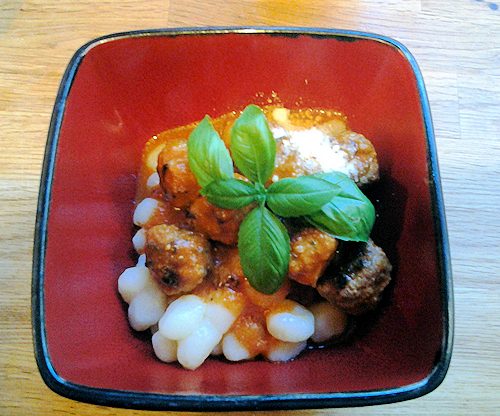 I have more recipes for gnocchi I hope to post. You know I told my husband it seems I am following an Italian theme exclusively. Not trying to, it’s just the way it seems to be going right now This recipeis so simple and fast to make on a weekday school night, I couldn’t resist. 🙂 Hope you enjoy!